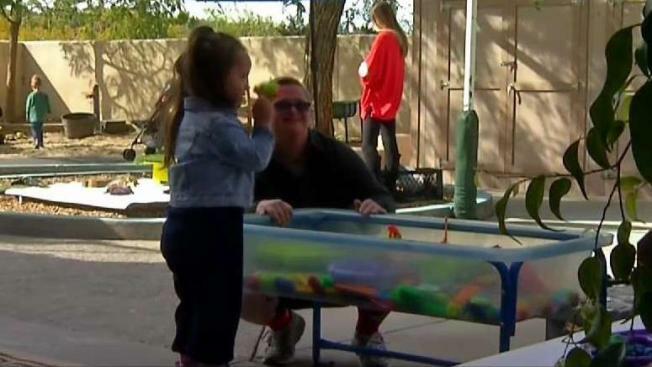 A friendship between a 4-year-old student and a 20-year-old teacher's aid at a Rancho Bernardo preschool has become a microcosm of a special program within the school that bridges the gap between special needs students and their peers. At first glance, the active playground at Rancho Bernardo Community Presbyterian Church (RBCPC) Preschool looks like any other. But in the middle of the laughter and play, something magical is happening. Ava Aria, 3, is a student at the preschool. She has Down Syndrome. Her mother, Jeanie Aria, said the preschool has been a tremendous blessing to her family. Ava loves her preschool and the friends she’s made but there is one friendship that stands out – it’s the special relationship she shares with Trevor Tibbs. Tibbs, 20, works part-time at the preschool as a teacher’s assistant. He too has Down Syndrome. Ava is part of RBCPC Preschool's Sharing Lives program. The program exists to give preschoolers like Ava, an experience that fosters learning, independence and acceptance. “We don't have limits for really anything, whether it's socioeconomic diversity, cultural diversity or diversity of needs," said Nanci Finch, Assistant Director at RBCPC Preschool. The Sharing Lives program, funded by RBCPC and private donations, supports kids with specialized materials, equipment and teachers’ assistants like Tibbs. The program even awards scholarships and has a number of community partners who help with specialized support. Kids in the program learn powerful lessons about acceptance, empathy and ability – lessons that Aria says quickly eased her anxieties about her daughter’s first school experience. Aria said part of what makes this preschool so amazing is the special friendship her daughter shares with Tibbs. When the two are together, they light up with smiles and laughter. “He really he looks at her right in the eye and he interacts with her," she said. According to his teacher and job coach at Abraxas, Dean Weese, Tibbs is a natural with the preschoolers. “Trevor became such a leader in the program here that they actually asked and called us and asked specifically for Trevor to come back,” Weese said. The story of how Tibbs and Ava first met is one everyone knows, and one those who know them can’t help but share. A picture of the moment Trevor first sat down and introduced himself to Ava during recess. It all started when Tibbs spotted Ava on the playground. He says he saw her sitting alone and knew they were alike, so he said hello and introduced himself. He told Ava that if she worked hard, she could grow up to achieve her dreams. Tibbs has been working at the preschool for nearly two years. His father, Ted Tibbs, said the opportunity has given his son new purpose and direction. “It really gives him a confidence that he couldn't have gotten anywhere else,” he said. His parents know how meaningful this preschool experience can be. They lived through the same uncertainty Aria found herself in before Ava started school. Nearly two decades before Aria made the decision to enroll her daughter at RBCPC Preschool, the Tibbs family made the same choice. "And because Trevor was here as a kid, he still remembers it and to come back and give back, which is what he's doing, he knows that he looks forward to being with these kids and is almost an expert in his field,” Ted Tibbs said. Trevor Tibbs said he has a reputation at the preschool. "They always say that I'm independent, a hard worker and very flexible and patient,” he said. Finch said the best part about the program is watching children connect with each other and love each other for who they are. “I think that we are one unique place where families know immediately when they walk on campus that they are welcome and that their children are welcome,” Finch said. For Aria, RBCPC Preschool is more than just where she drops her child off to learn. It’s become a second home. Right now, there are 235 preschoolers enrolled at RBCPC Preschool, and 15 are identified as having special needs. To donate or learn more about the RBCPC Preschool program click here. Follow RBCPC Preschool on Facebook and Instagram.